This could be historic: Astronomers from Leicester University have detected a strange signal in the X-ray spectrum that appears to be a signature of 'axions' — a hypothetical dark matter particle. It could take years to confirm, but this may be the first direct detection and identification of dark matter. The study has the potential to significantly advance our understanding of dark matter and the way our Universe works. Though it has never observed directly, astronomers are certain dark matter exists because, without it, galaxies would just unravel and fly apart. Moreover, even though it doesn't emit or absorb light, it exerts gravitational pull on celestial objects we can observe. To put it bluntly, it's dark matter that holds the Universe together — and it may comprise up to 85% of all the stuff within it. The idea of axions has been around for a while. It was postulated by the Peccei-Quinn theory in 1977 to resolve a nasty problem in quantum physics. Only later did physicists realize that it was a viable candidate for the cold dark matter implied to exist by astronomical observations. According to theory, axions are able to 'feel' electromagnetic interactions despite not carrying an electromagnetic charge. This would imply that, should an axion come into contact with a magnetic field, it could convert into photons — which is something we can detect. What's more, if they do indeed exist, they're expected to be produced in the core of the Sun. Related: Alternative dark matter particle could explain the universe's lithium shortage | Who needs particle accelerators when you can just use black holes? Who needs particle accelerators when you can just use black holes? Sadly, the lead author of the new study, George Fraser, passed away in March — one day after his team submitted it to the journal Monthly Notices of the Royal Astronomical Society. The potential discovery of axions was found through an exhaustive study of practically the entire archive collected by the ESA's X-ray observatory, XMM-Newton. That's 14 years of X-ray observations! In particular, the scientists were looking at data where there appeared to be an unexpected seasonal modulation in the X-ray flux — modulations consistent with the conversion of axions churned-out by the Sun into X-ray photons as they pass through the Earth's magnetic field. To date, other hunts for the elusive elementary particle have come up nil, including those conducted at CERN and by other spacecraft. Normally, the X-ray background — the sky after galaxies, stars, and other bright X-ray sources have been filtered out — appears to be unchanged when it's observed. "However, we have discovered a seasonal signal in this X-ray background, which has no conventional explanation, but is consistent with the discovery of axions," noted study co-author Andy Read in a statement. 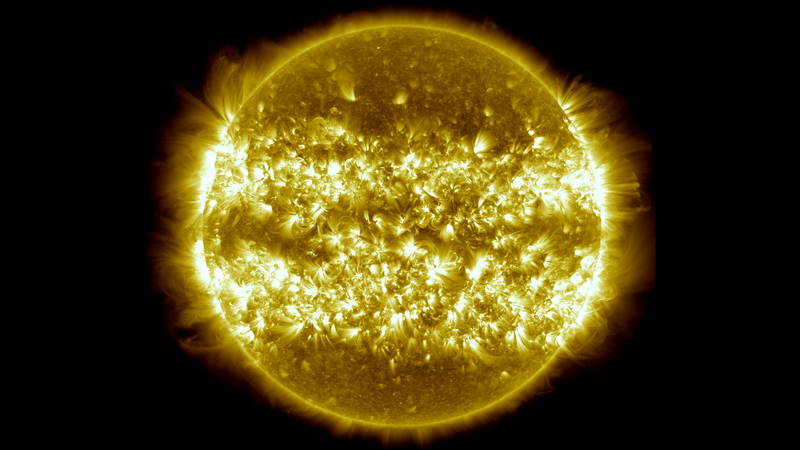 Given the dearth of explanations, the researchers turned to more radical theories, including the suggestion that axions — the theoretical particles of dark matter — are streaming from the core of the Sun and producing X-rays when they smash into the Earth's magnetic field. According to the researchers, it's possible that axions are produced in the core of the Sun and that they convert to X-rays in the magnetic field of the Earth. It has been suggested that the X-ray signal due to axions will be at its greatest when observered through the sunward side of the magnetic field — the place where the field is strongest. The researchers noticed that the intensity of X-rays rose by about 10% whenever the spacecraft measured the boundary of Earth's magnetic field that faces towards the Sun. If these particles are indeed axions, then they must be incredibly light, featuring a mass of around a hundred billionth of an electron. "These exciting discoveries, in George's final paper, could be truly ground breaking, potentially opening a window to new physics, and could have huge implications, not only for our understanding of the true X-ray sky, but also for identifying the dark matter that dominates the mass content of the cosmos," added Read. No doubt, if confirmed — and that's a big if — it would represent the first direct detection and identification of dark matter particles. The researchers admit that the findings are tentative, and that it could take years to confirm. Indeed, given the recent BICEP2 fiasco, it's probably a good idea to hold back on sure-fire proclamations. What's more, and as noted by physicist Christian Beck in the Guardian, it's not entirely clear that other explanations of the measured effect can be excluded. "A true discovery of dark matter that is convincing for most scientists would require consistent results from several different experiments using different detection methods, in addition to what has been observed by the Leicester group," he is quoted as saying. The Leicester astronomers are hoping they can double the dataset from XMM-Newton in a few years to help confirm the result. But if proven correct, the discovery is poised to make a fundamental impact on our theories of the Universe. Read the entire study at the arXiv pre-print archive: "Potential solar axion signatures in X-ray observations with the XMM-Newton observatory". The study is set to appear in an upcoming edition of the Monthly Notices of the Royal Astronomical Society. Additional information via Guardian.